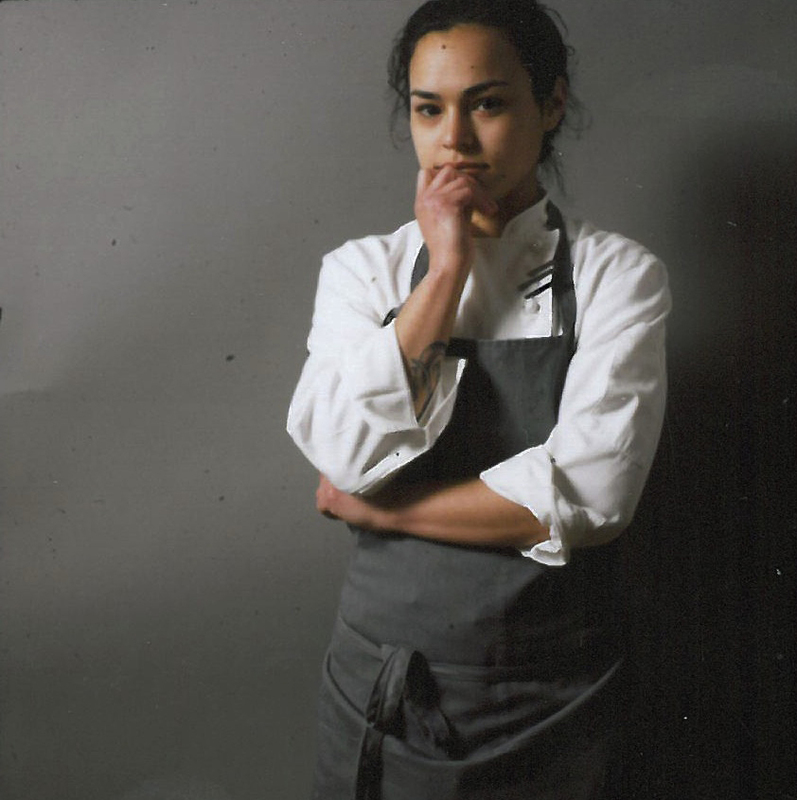 Veronica Trevizo is the Development Chef at Momofuku Culinary Lab. Veronica hails from California, where she was born in San Diego, attended the California Culinary Academy, and worked at such venues as the Four Seasons in San Diego and the San Francisco establishments Jardinière and Michael Minas. She also spent time working at Spagos in Maui and has worked all over Europe, completing stages in Spain and at Noma in Copenhagen, before relocating to New York to work in the Momofuku Culinary Lab. I grew up in a traditional Hispanic family in which every month there was some sort of barbecue or grand family dinner. My fondest memories of my childhood revolve around those special occasions. I always found myself in the kitchen with my mother and Tias preparing the meals, feeling excited as I watched them cook and sneaking bits of food and knowledge. When they tried to shoo me from the kitchen, I stayed, and to this day I don’t want to be anywhere else. I would have to agree with Dan and select our ongoing projects based around microbes and fermentation. At the Momofuku Culinary Lab we have been quite successful with our projects involving miso and other traditional fermentative products. 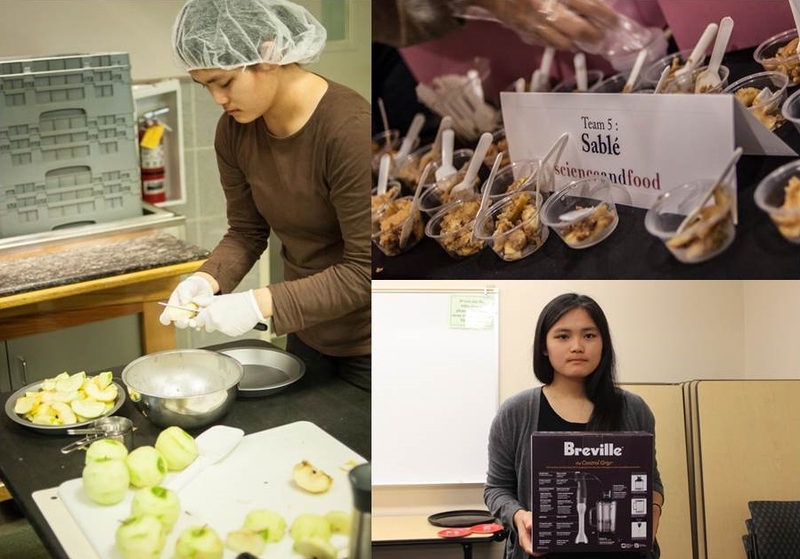 These projects generated relationships and connections with experts in the scientific field, furthering our understanding and abilities to explore just how far we can evolve food sciences. 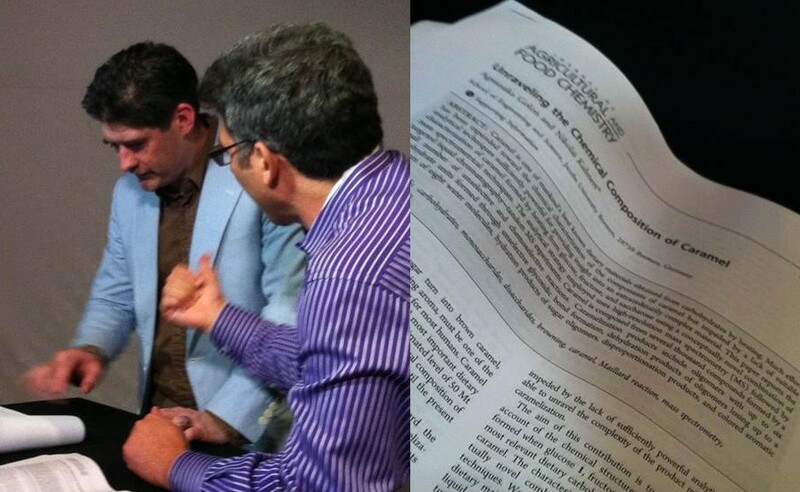 It is my personal goal to continue to progress the collaboration between food and academia. Processed food. I find it fascinating that so much work and money is used to produce foods that are unhealthy, poor tasting, and downright bad for people. 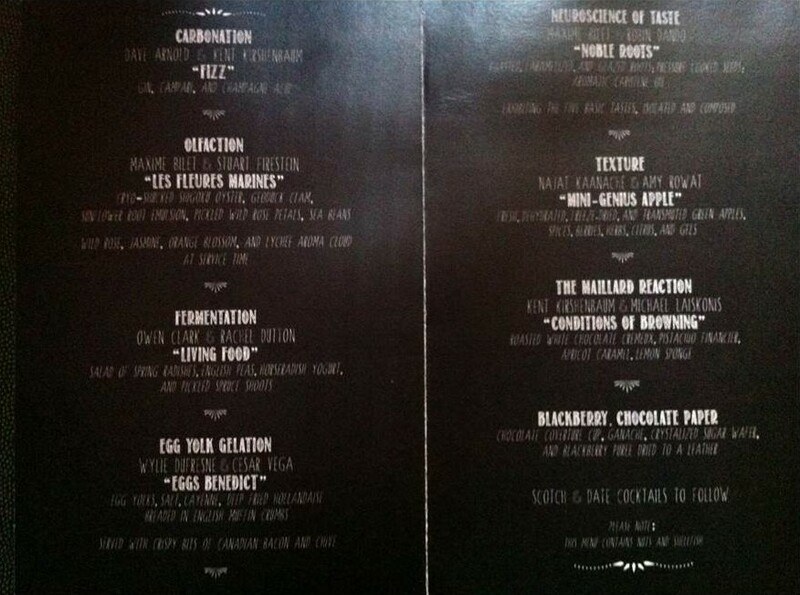 • Maillard reaction: when compounds form together, creating new compounds that make a very distinctive flavor. For example, crust on bread and sugar to make caramels. • MSG: there are so many ideas out there but none that are really true. This subject always seems to start a conversation. • Neurogastronomy: an understanding of why we perceive something as delicious or disgusting fascinates me. The age old fight: “my mother’s food is better than yours!” There is so much going on that we just don’t fully understand yet. Milk. Pasteurization is a science win that absolutely highlights the importance of science in food. 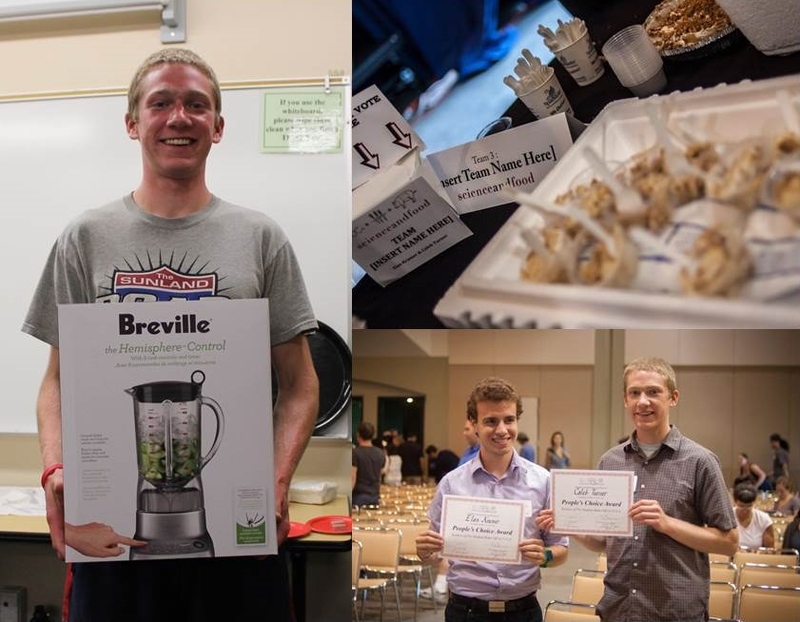 In the past years, we’ve seen the huge impact that science has had in our kitchens. A great example is the science-imagined and science-enabled equipment like centrifuges, cryovacs, and sous vide machines. Using equipment that is seen in laboratories now in almost every kitchen makes both fields more robust and makes our work even more informative for the public. As a cook, it has also helped me understand that scientists and chefs are not so different. I would say the impact is already here in the culinary world but I definitely see much more collaboration in the future. It starts with equipment and continues with the sharing of knowledge. • Honestly, not that much! The fridge I’m thinking about is always the one at the lab. I can’t live without salt! 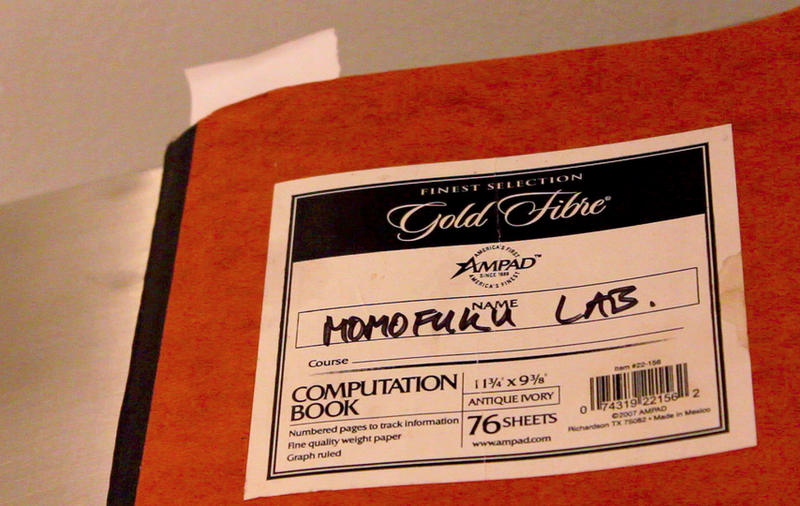 My favorite cookbook… there are so many. I do love Julia Child and remember reading Mastering the Art of French Cooking religiously as a child. I usually just have black coffee. But I do love chilaquiles! 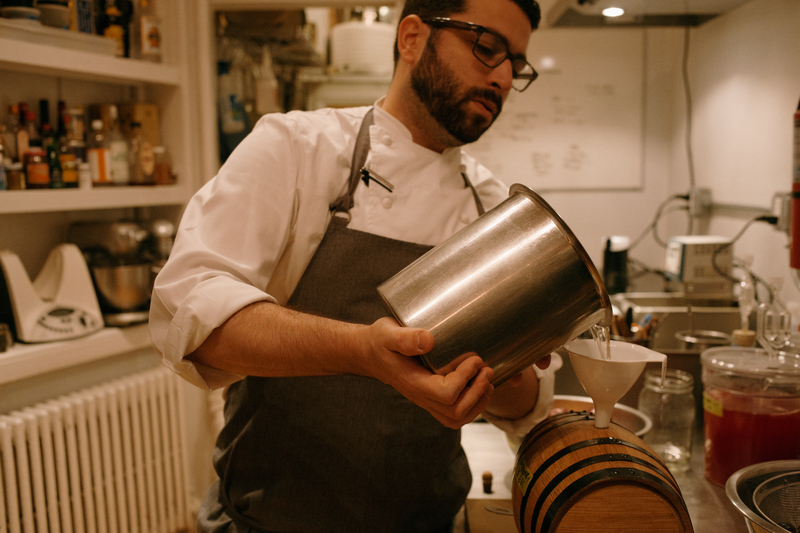 Daniel Felder is the Head of Research and Development at the Momofuku Culinary Lab. Dan is originally from Roxbury, Connecticut, and began working in restaurants at the age of eighteen while he was studying at Union College in Saratoga Springs, New York. He moved to New York City and joined the Momofuku team in 2008 at Noodle Bar and Ko, and now at the Momofuku Culinary Lab. Both my parents are quite good home cooks, and let me cook with them from a really early age, sitting at the counter watching and then helping as I got older. My great-aunt is an amazing home cook, and still lives in Rome. She had an impact on me and my cousins, as four of us now work in the food industry. Learning from her was a challenge; she wouldn’t give up her secrets unless you earned them, usually by doing some unrelated task for an extended period of time. Once I got my food in the door of professional kitchens, it was a similar scenario. You have to earn knowledge. That’s the slippery slope for me; learning something new in the kitchen repeatedly opens my eyes to how much more there is to learn. 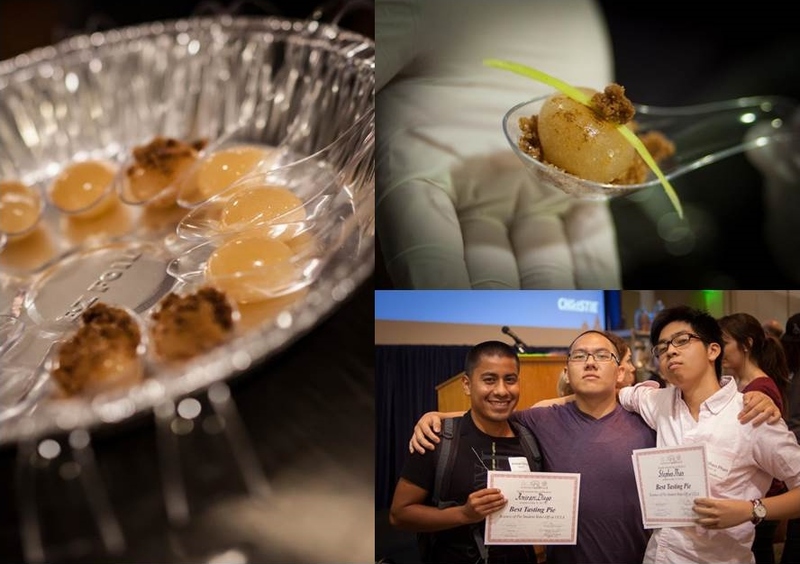 One of the coolest examples is probably the ongoing projects at the Culinary Lab based around microbes and fermentation. The heart of this process for us was really the application of scientific methodology. Applying scientific structure and procedures to how we pursue a question has actually given us a lot of freedom in how we experiment. By breaking down and understanding the mechanics of a process we can’t see with the naked eye, we can start with a grounded hypothesis and begin manipulating variables until we get to where we want to be. Our miso is a good example of this process. I am really fascinated by starches, grains, root vegetables, etc. I realize it is pretty familiar and basic territory, but I think the bio-technological capacity of rice and grains, for example, is really incredible. We have only scratched the surface of what we can do with it. There has been a lot of research with corn and different starches for industrial purposes and alcohol, but as cooks, I think we have so much more to discover. • Why starburst candies cause extreme salivation. • Metabolic pathways. Specifically, how the body metabolizes sugars and amino acids. • Correlation of fermentation to larger biological processes. Not to be gross, but the idea of “out of body digestion” is really interesting to me. Can we extrapolate and apply the mechanism of digestive processes in the natural world as catalysts in the kitchen? Fermentation is a familiar example of this idea, but I believe we can take it a bit further by looking at more diverse biological processes, and hopefully reveal new nutritive resources (hopefully delicious ones) as a result. As a corollary, the things Alex Atala, Noma, and the Nordic Food Lab have found by exploring potential food sources in their respective environments is both very interesting and indicative of what is in the immediate future for science and food. In our lab, we are looking at how we can extend this idea to process as well. 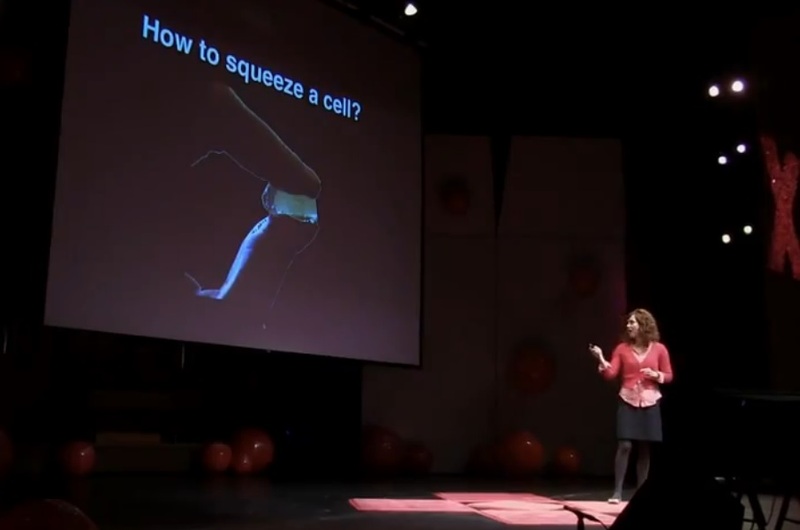 ow can we disinter biological processes from the natural world and bring them into the kitchen? Rene and Lars gave the perfect answer: spoon. I can’t compete with that. If I had to pick one for the Momofuku Culinary Lab, I would go with a Dremel. That’s hard to say. Butter, maybe? Bread? Also hard to choose. Right now we have a copy of Ben Shewry’s new book, Origin: The Food of Ben Shewry, in the Culinary Lab. It rules. I don’t really eat breakfast, but, if I make it on the weekend, it errs on the English breakfast side of things: poached eggs, tinned beans, potato, tomato, sometimes a breakfast meat. Conversely, I am also a sucker for huevos rancheros. Egg white content affects mousse texture. 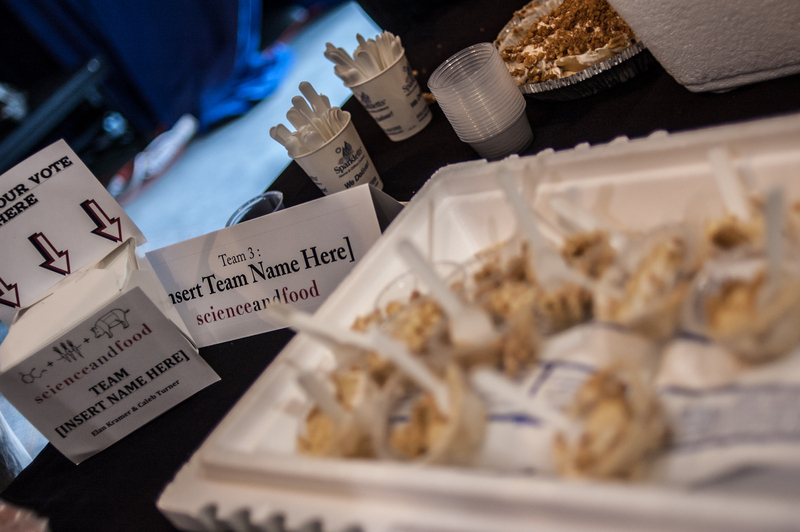 (A, B) Team “Insert Team Name Here” visualized the air bubbles incorporated into peanut butter mousses prepared with different amounts of egg whites. (C) Using image processing techniques, they calculated the mean (red) and median (blue) air bubble areas as a function of egg white content. Their results show that there is indeed an optimal egg white content for creating an light, airy mousse. (D) An egg white is made up of many proteins suspended in water. Whipping incorporates air bubbles into the egg whites, causing the proteins to unfold as they are exposed to air. Denatured proteins [link to ceviche recipe] form networks at the liquid/air interfaces that stabilize air bubbles within the egg white foam. To prepare the apple layer, melt the butter in a large sautée pan. Stir in the apples and granulated sugar and cook over medium heat, stirring often, until tender, about 5 minutes. Stir in the lemon juice and powdered sugar and cook, stirring, for 1 minute longer. Remove from the heat and refrigerate. To make the peanut butter cloud layer, use an electric mixer to whip the heavy cream until it holds semi-firm peaks. Cover and refrigerate. Using the mixer, beat the cream cheese and peanut butter together until smooth. Gradually beat in the sugars, then the vanilla. The mixture will be lumpy, like cookie dough. Add the whipped cream to the peanut butter mixture, slowly blending them together with the electric mixer until smooth. Clean and dry the beaters. Using a clean bowl, beat the egg whites until they hold stiff peaks. Fold the whites into the peanut butter mixture with a rubber spatula until evenly blended. Put mixture into the pie crust, cover loosely with aluminum foil and freeze for at least 5 hours. When you’re ready to serve the pie, take it out of the freezer and top with the refrigerated apples. For the topping, add the powdered sugar and 1/2 teaspoon to the cream and use an immersion blender or mixer to whip. Spread over the top of the pie and sprinkle with peanuts, graham cracker crumbs, and remaining cinnamon. Seeking to perfect pie crust texture, team Aπ3 experimented with different liquids that may impede the formation of gluten protein networks. Gluten gives structure and stability to pie dough, but can also make pie dough dense and tough when over-developed. 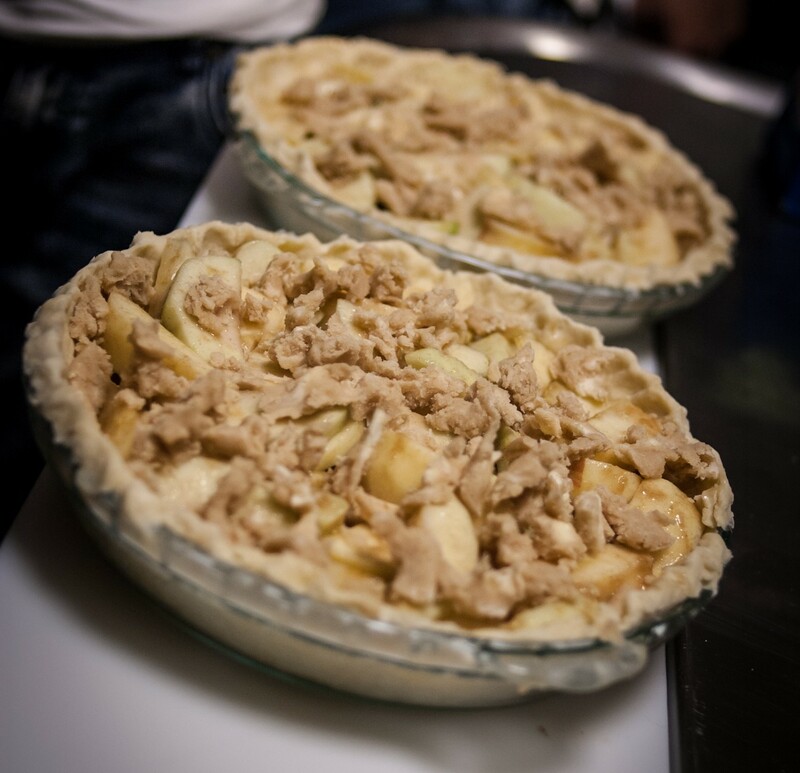 The team examined the porousness, density, and browning of pie crusts prepared with their three different liquids compared to water and concluded that vodka creates the flakiest pie crust. Different liquids affect the density of pie crust. (A) Pie crust prepared with alcohol (beer or vodka) is less dense than pie crust prepared with water. Interestingly, carbonated water also lowers the density of the pie crust compared to water. (B-E) Team Aπ3 did not observe much difference in the browning of pie crusts prepared with water (B), carbonated water (C), beer (D), or vodka (E). *Team Aπ3 used a half Fuji and half Granny Smith apples. To prepare the crust, mix the dry ingredients. Cut in the cubes of butter until the butter forms approximately pea-sized pieces. Add water and vodka one tablespoon at a time, alternating the liquids. Only add liquid until the dough starts to come together and can be formed into a ball. Chill dough for at least 30 min. Roll out the dough and press into a pie pan to form the bottom crust. To prepare the filling, mix all filling ingredients. Spread the filling mixture on top of the bottom crust. Try to arrange the filling so that the top of the pie is flat. To prepare the streusel topping, combine the flour, brown sugar, and cinnamon. Cut the butter into small pieces and incorporate into the dry ingredients until the butter is in very small pieces. Spread the streusel topping over the pie filling. Bake pie at 375F for 45-50 min. Calcium promotes the solidification of alginate networks. Alginate is a long, negatively charged molecule called a polysaccharide. Positively charged sodium ions (Na+) dissociate from the alginate when dissolved to create a goopy but liquid solution. Doubly charged calcium ions (Ca2+) can bind two different alginate strands simultaneously, thereby crosslinking and solidifying the solution. Increasing the number of calcium crosslinks by raising the concentration of calcium chloride and/or lengthening the soaking time create a more solid gel. *Team Apples to Apples recommends using pulp-free organic apple juice. Freshly pressed apple juice tends to have too much pulp, while additives in non-organic apple juice may interfere with the spherification process. **For the Science of Pie, Team Apples to Apples used 10g of sodium alginate in 1 L of apple juice and 20g of calcium chloride in 1 L of water. This recipe does not require such large volumes, but it is important to maintain these ratios as they affect the gelation time for the apple spheres. Mix the sodium alginate into the apple juice. We recommend using an immersion blender, but whisking vigorously will also work. Let the solution sit until any foaming subsides; if large amounts of foam formed during mixing, you may also want to skim foam from the surface of the solution. The solution is ready for spherification once it has reached almost an apple sauce viscosity. Prepare your calcium bath by dissolving the calcium chloride into the water. Mix lightly; the solution is ready once all visible particles have disappeared and the liquid it appears translucent again. To create each spherified apple, scoop no more than one tablespoon (it becomes increasingly harder with bigger volumes) of apple juice solution using a deep spoon and carefully drop it into the calcium chloride solution. It helps to use a second spoon to scoop the apple solution out of the first spoon. This is mainly technique—you will get the hang of it after a dozen or so attempts! Let the apple juice solution sit in the calcium chloride solution for approximately 30 seconds. There will not be a noticeable difference if left for an additional 30 seconds, but the apple juice solution will continue to solidify as it sits in the calcium chloride solution and fully solidify after about 10 minutes. Feel free to play around with the timing of this step to achieve the desired spherified apple texture. To serve, place the spherified apple in an Asian-style soup spoon and garnish with a bed of sugar and graham cracker crust crumbs, a sliver of green apple skin, and a dusting cinnamon. More information about spherification can be found at Molecular Recipes. 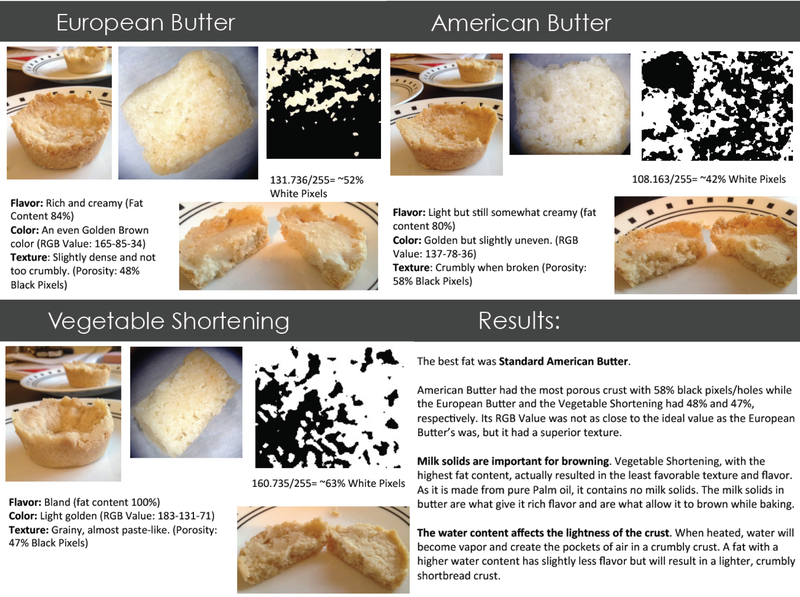 Effect of different fats on the shortbread crust. The quality of the shortbread crust was evaluated based on its color and texture. Porousness (“porosity”) was quantified by converting crust image pixels to black or white, with black pixels representing holes in the crust. A higher percentage of black pixels corresponds to a higher porosity and thus a crumblier crust. The extent of browning was quantified by calculating the RGB values of each crust image and comparing to a “deep golden brown” color standard (RGB 184-134-11). Standard American butter created the most desirable crust in terms of both browning and porosity. To prepare the filling, cut the apples into approximately ¼ inch slices. Combine with the remaining filling ingredients and sautée over low heat until the water from the apples forms a sauce and thickens slightly. Set aside to cool. To prepare the crust, whisk together flour, sugar, and salt. Cut in the butter with knives or a pastry blender. Pour the mixture into a pie pan and spread evenly with back of a large spoon or measuring cup. The crust should be about 1/2 inch thick. Bake crust at 375F for about 15 minutes or until the crust is a light golden brown. Allow the crust to cool for 2-3 minutes, then brush with the egg white. While crust is baking, prepare the streusel. Combine the dry streusel ingredients. Mix in melted butter and honey to form clumps. Set aside. To assemble the pie, pour filling into the pre-baked, egg-washed crust and sprinkle streusel on top. Bake for about 35 min at 375F. Streusel should be deep golden brown. 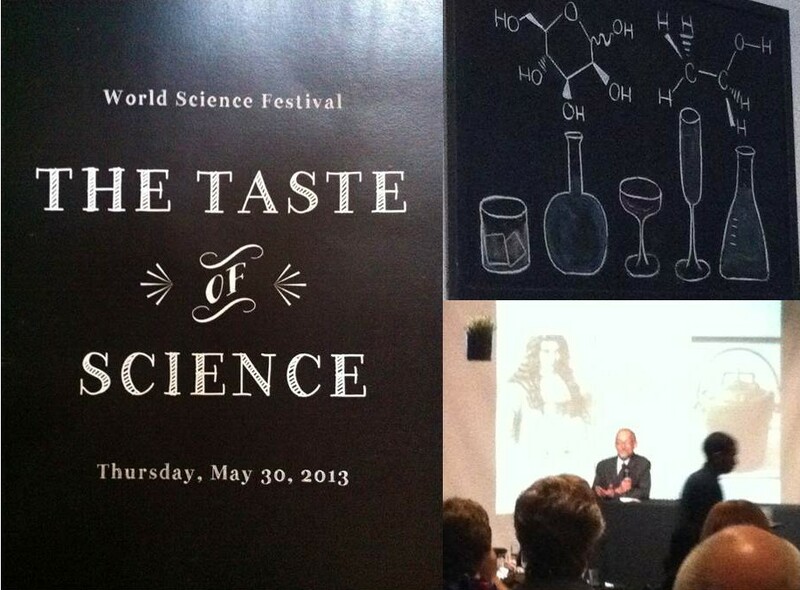 Professor Amy Rowat, Science & Food’s fearless leader, was lucky enough to spend the week at the 2013 World Science Festival in New York City. 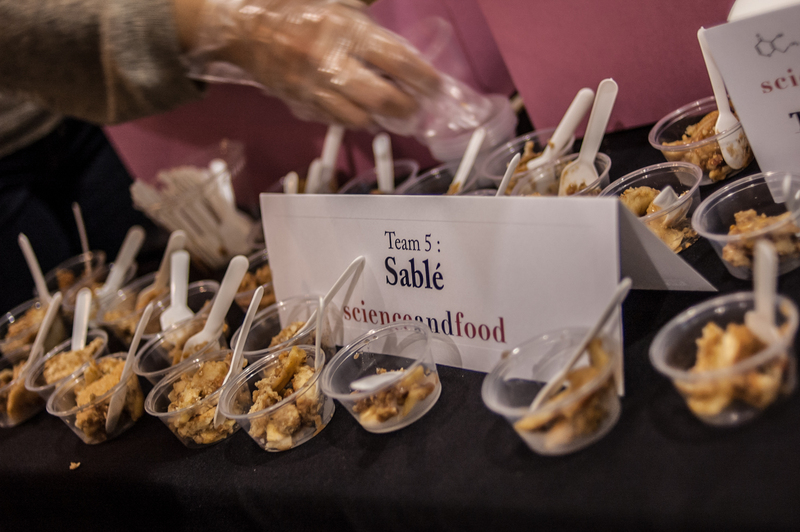 Scientists featured in the festival discussed everything from quantum mechanics to nanomedicine; Professor Rowat helped bring scientific discovery to life at The Taste of Science, a multi-course meal highlighting the power of gastronomic experimentation. 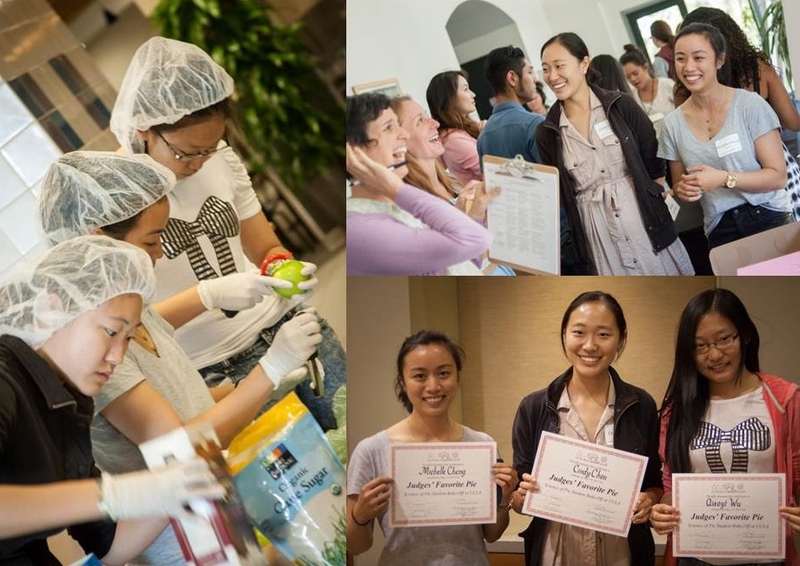 And what a feast it was–physics, chemistry, neuroscience, and microbiology all packed into ten courses. 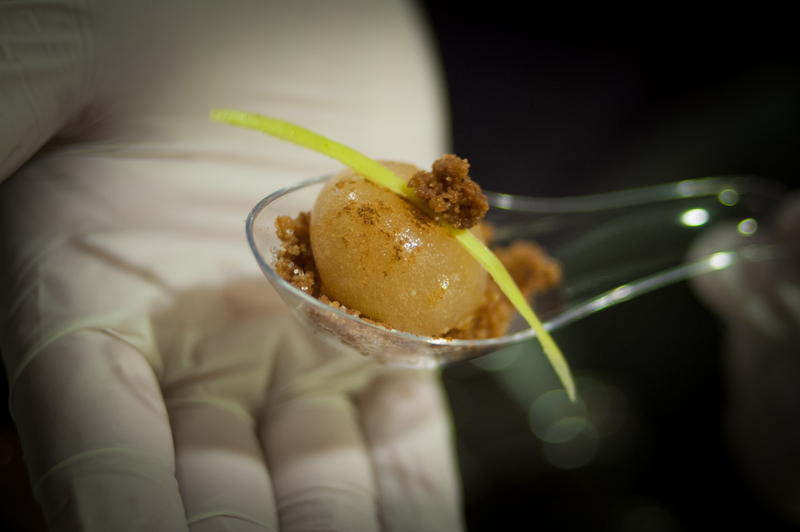 Creative dishes prepared by visionary chefs provided an edible demonstration of intriguing scientific concepts. Writer and food critic Jeffrey Steingarten, notorious for his scathing reviews as an Iron Chef Judge and not one to dish out compliments, seemed quite delighted at the end of the night and even admitted that this was the overall best modernist meal he had ever had! Before the event, Chef and Cocktail Master Dave Arnold of Booker & Dax and NYU Chemist Kent Kirshenbaum prepare for their presentation on cocktail science (left), and Dr. Kirshenbaum catches up on a little last-minute preparatory reading (right). Chefs Najat Kaanache and Bill Yosses strategize their “chocolate paper” dessert, featuring the structural molecules of fruits, such as pectin (left). 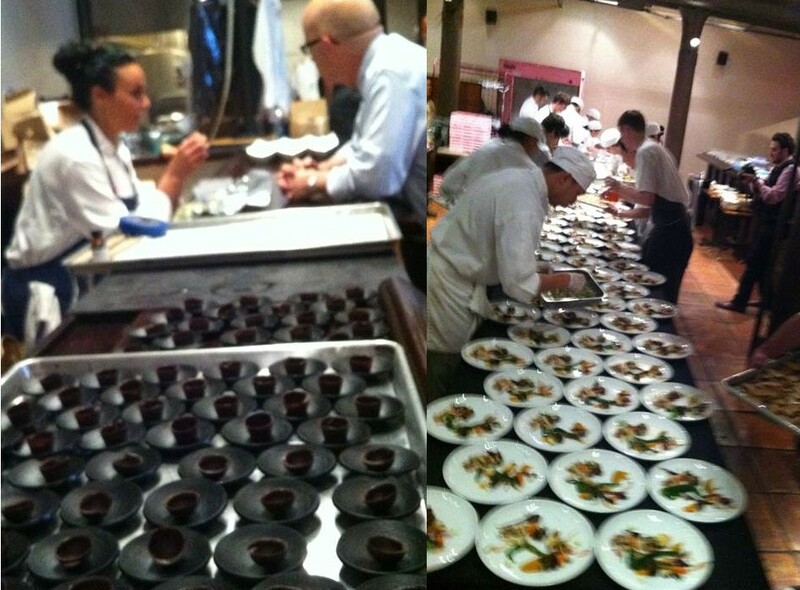 Meanwhile, Maxime Bilet’s team is hard at work plating their “Noble Roots” dish for the Neuroscience of Taste (right). 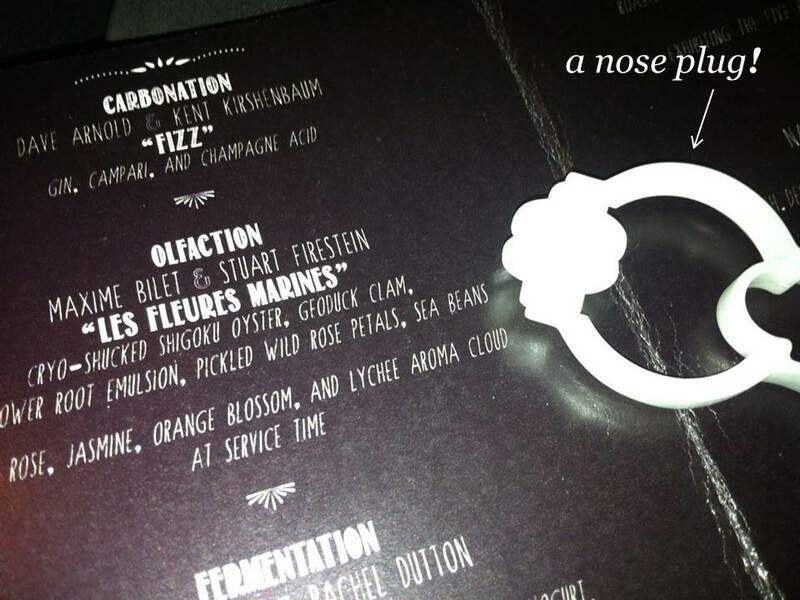 Equipped with complimentary nose plugs, neuroscientist Professor Stuart Firestein of Columbia University led the audience in a sensory experiment to experience the role of smell in taste perception. Jelly beans just don’t taste the same without a sense of smell! 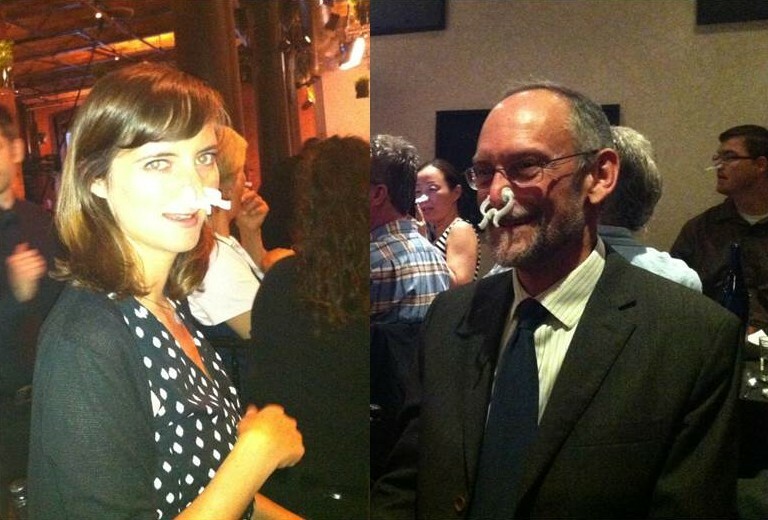 Professor Rowat’s dining partners, Harvard microbiologist Dr. Rachel Dutton (left) and Harold McGee (right), partake in the grand olfactory experiment.